Welcome to the first post by Rocky Intertidal CoCreative, the Columbia Pacific region’s newest boutique marketing and public relations firm. We’re based in Manzanita, Ore., a tiny coastal community beneath Neahkahnie Mountain, populated by artists, retirees, merchants, surfers, golfers and people such as ourselves who make a living with ideas, a laptop or two and an impressive roster of connections. 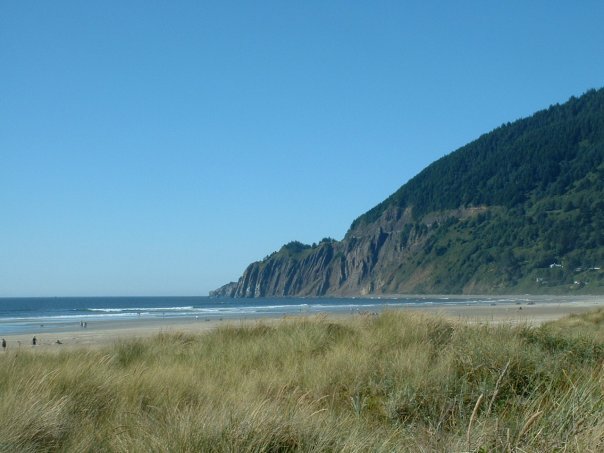 Neahkahnie Mountain as seen from Manzanita Beach. Manzanita and the rest of the Nehalem Bay area are also home to a remarkable array of forward-thinking individuals who have done everything from found innovative nonprofit organizations to design international award winning architecture to develop a sustainable, off-the-grid teaching and working farm. What a great place to live and work! While Rocky Intertidal CoCreative is a new business, the people behind it aren’t new to generating positive publicity for individuals, businesses and other organizations. Nor are we new to the north Oregon coast, both having lived here most of our lives. Posted by rockyintertidalcocreative on August 1, 2011 in Uncategorized.